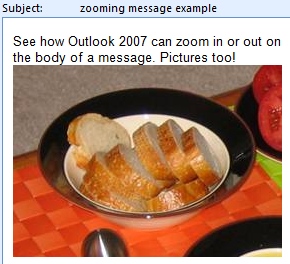 One great new feature of Outlook 2007 is the ability to zoom in or out on the body text of e-mail messages, calendar entries, tasks, and contacts. The ability to zoom like this can be a huge benefit for anyone who has trouble reading the text on the screen. The Zoom command is simple to use, and the benefits are obvious to anyone who spends their day squinting at their computer screen. It only takes a moment to learn how to Zoom, and will free you from some eyestrain. But as always, there are a few more things to know when you use it. The item you want to zoom must be open in its own window. Zoom doesn’t work in the Reading Pane. If for example, you want to zoom the body of a message, you point the mouse at a spot in the message body and click the mouse button. This selects the area and activates the Zoom command. If the area the cursor is in right now isn’t zoomable (say the Subject line of a message), the Zoom menu option is dimmed. The Zoom command appears in the Other Actions menu for messages, and in the Zoom group of the Format Text tab of the Ribbon for other Outlook items. Zoom is clearly the way to go when you want to adjust the size of the text in one of the zoomable areas. While you can’t zoom things like column headings and menus, there is a way to modify these. just much more complicated and time consuming. So a good compromise that improves readability without too much work is to use the Zoom command wherever possible, and live with the small headings and so on. This entry was posted in Computers and Technology on January 12, 2014 by admin_z.